War is not something that can be appreciated with joy in oneÕs heart. Some of us were of the opinion that this war with Iraq would be a piece of cake. Well, we now see some body bags and more to come as we near Baghdad. As a Nation we have to support our troops. Our service men and women signed a contract to save our Nation and they also signed a contract to take orders from the Commander in Chief - in this case President George Bush. Many of us who know the inner workings of the Armed Services felt betrayed the last time around in 1991 - the war with Iraq - Desert Shield and Desert Storm. This time around the Shock and Awe has not fazed us a bit - we are focused on our Armed Forces - our women and men - and feel bad when some of them are killed. Also, we are very concerned about those who are taken Prisoners of War (POW). During this final stage there is every likelihood that chemical warfare will be used to harm our service women and men. If Sadam and his generals take this plan to fruition - we may see some very serious consequences. For Sadam Hussein dying is better then being captured. Many Americans do not understand that Sadam has brain washed Iraqis for over 30 years. The Iraqis have fear in there hearts and subconsciously adore this monster of a person. We see conflicting signals in the street that have been liberated by American and other supporting forces - and fail to understand why our coalition forces are meeting with resistance. In the first place some of the Iraqis do not know better. In 1991 we requested the Kurds to rebel against Sadam Hussein and when the moment came we did not support them. Many of them died at the hands of the Sadam regime. Many Iraqis are not certain if this will be a repeat. Secondly, they have never seen what it means to be free - and they will learn about living in freedom and take months if not years to relish the blessings of being in a democracy. Often times we think because we are free and have a working democracy - other countries can do the same. Many of us do not know that in order to own a radio in Iraq - one has to get some license from the Iraqi authorities. The same if one owns a computer or typewriter. Any tool of communication is censored and monitored. Our service men and women have reached a final stage when the fighting will be heavy. Our prayers go to them and I hope that we do not see too many body bags. It is very painful to see loved ones mourn for those they wish were alive - but are now dead. Our leaders at the White House have cooled down their rhetoric in the last few days. It is easy to brag when the going is good but when we see body bags - most Americans cannot and will not stomach that. We are the world best nation when it comes to appreciating life. Many civilians will die. Many will die slow death if they are exposed to germ and chemicals that can adversely impact their health for life. We pray that the Iraqi General will see good reason and not harm anyone by using weapons of mass destruction. 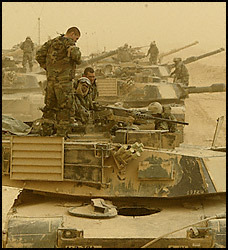 We are fully aware that Iraq has them - but they have NOT used them to date - we pray they will not use them at all. We sincerely hope that there will be peace in the Middle East.